Out-of-Sync: The Paradoxes of Time :: until May 22, 2011 :: Mudam Luxembourg, Musée d’Art Moderne Grand-Duc Jean, 3, Park Dräi Eechelen, L-1499 Luxembourg. a canary torsi by Yanira Castro, Rozalia Jovanovic and YOU :: Call for Proposals: Deadline: March 16, 2009. 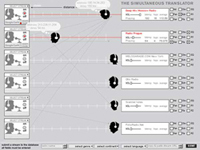 The Simultaneous Translator (SimTrans) is a Windows based audio interface that enables anyone to load audio streams and manipulate them in real time on the Internet. SimTrans makes the delays and fluctuations of the Internet visible and audible. The Internet becomes your collaborator as you create your mix, and the instability you usually try to avoid becomes a tool for creation. Distance and delay are manifest within the interface numerically and as a series of sliding heads; there is also a link to Google Earth where you can watch the dynamic flight of data travel between yourself and the audio source. Sound Garden: asynchronous improvisation by Norbert Herber + others :: telematic environment for musical becoming & interaction :: Web stream (using iTunes, Real Player, WinAmp, or Windows Media Player) :: Installation: Radio-TV Center (WTIU, WFIU, Department of Telecommunications) IU Bloomington campus. 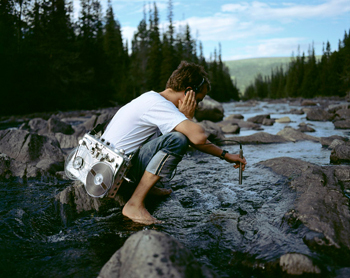 Sound Garden is the second work in a series of musical installations that explore the relationship of people, location, and audio relative to technology. Listeners use the online interface to tend their sonic environment and take an active role in its composition and care. 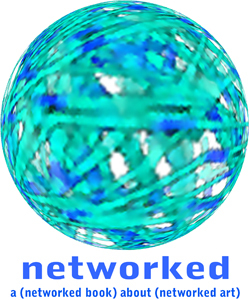 Using a web browser to select from a menu, participants can contribute their own digital audio files (musical material, voice and environmental recordings, etc.) and become gardeners that help to form the overall sonic landscape of Sound Garden. Thresholds, the bi-annual critical journal of architecture, art and media culture of the department of architecture at MIT invites submissions for issue 31 ‘ephemera’: DUE: October 31, 2005. We have accelerated into an age in which information is as fleeting as our response to it, and the capacity for its processing the new world currency. The relevance of the moment has become eclipsed by that of its own passage, and absolute position has become an easy sacrifice for the velocity on offer. We have been at last swept by the flux of our times into a time defined by its own flux. Time has become both the axis and the function. Thresholds 31 seeks to explore this condition through identifying, suggesting, tracing and questioning the notion of ephemera* through time and cultural relevance. What role does ephemera play within current cultural practice and thought? What are its historical traces and its cultural import? What are the projects in which it has become manifest deliberately, or not and why? Are we longing for a future or a past, or neither? On Saturday, April 24th, 1999 at 9:24 and 21 seconds, a portion of the Performance in Plato’s Cave was transmitted over the internet. In an attempt to follow the PlatoÂ’s Cave Performance we have to realize that there are three distinct performances going on simultaneously. 1. The Fake Performance was made to transmit from another location over the Internet in case the equipment failed at the Cleveland Performance Art Festival. The equipment did fail and the fake was transmitted; 2. The Environmental Performance was Alice in Wonderland’s tea party adapted to a modern world environment. This also is the Internet Performance; The Non-Performance was a preparation for a conventional performance that would not occur.